What is the smallest air compressor for air tools? That seems like a fairly simple question but, you’ll need to read on a bit to understand why it is not so simple to answer after all. It sure helps to understand how much compessed air an air compressor is capable of delivering yet the complexity comes into it when you consider the vast array of compressors, and the vast array of air tools you can add to your air tool inventory. This page is oriented to folks that operate the typical, fairly small, .5 – 3 HP sized home air compressors. I know this doesn’t completely help if you have a gas or diesel powered air compressor though the same principles will apply to those compressors too. As a rule of thumb, the typical air compressor will deliver about 4 CFM of compressed air, at 90 PSI, for each horsepower of compressor motor size. So, using that rule of thumb, since a 1 HP air compressor can deliver about 4 CFM of air at 90 PSI, is 1 HP air compressor the smallest air compressor for air tools? Here is an air tool. Will a 1 HP air compressor run this? Can a 1 HP air compressor run this air nailer? The photo above is of an air nailer. What is it about the air nailer that would make it suitable for being supplied by a 1 HP air compressor? It is because this air tool does not run constantly, but is used intermittently. The air nailer is placed against a work piece, the trigger is pulled, the air nailer cycles and drives the nail, and then the air nailer stops using compressed air until the process is repeated. A 1 HP air compressor with a reasonably sized air tank, say a 10 gallon or so, should be able to have sufficient air delivery and air reserve in the tank to drive this air nailer all day long, as long as it is fired intermittently. It might be a stretch if this was a roofing nailer, with two persons laying shingles and one person using the nailer to drive nails into the shingles non-stop. That being the case (and I’ve done it) it may be necessary to stop nailing every few minutes to allow the smaller air compressor to catch up. How about this next air tool? 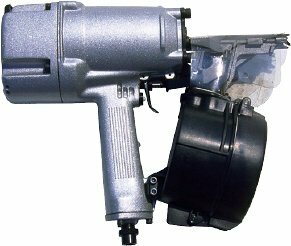 Can an Air Ratchet be driven by a 1 HP air compressor? It’s an air ratchet, or it may sometimes be known as a nut runner. 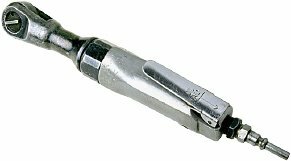 With a tank full of 120 PSI air, and a fairly small nut to remove from a bolt, this air tool could be driven by a 1 HP air compressor. Smaller ratchets use 3-4 CFM of compressed air to run. Larger ratchets may need 5 CFM or more to run properly, so, you could run the larger ratchet for a while with your 1 HP air compressor, but the demand of the air tool would eventually outstrip the air supply capacity of the compressor, your available air pressure would decay, and eventually the ratchet would not work. So What is the Smallest Air Compressor For Air Tools? Well, we have seen that the air demand of the air tool will determine whether an air tool can be run by a specific air compressor. Can you run an air tool with a 1/6 HP or even smaller compressor? As long as the air tool has a compressed air demand that is equal too or less than the capacity of the air compressor to deliver air, you can run that air tool with any sized air compressor. 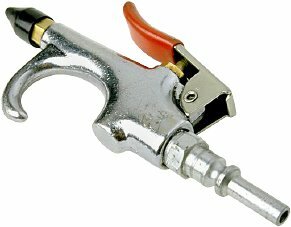 How about this air tool? Run a compressed air blow gun with a 1/6 HP air compressor? A blow gun is a very high demand air tool… very high. So sure, with a gallon sized air tank on a 1/6 HP air compressor, you could run this blow gun. But not for very long. It would drain the tank in seconds (depending on the pressure setting on the regulator) and would easily use much more air than the 1/6 HP driven compressor pump could deliver, and soon you would have virtually no air coming out the nozzle of the air gun. Would you expect to enter and win the Daytona 500 with a 4 cylinder econobox car? Not likely. It would be hopelessly under-powered for the expected use. So too it is for air tools and air compressors. Don’t purchase an econobox air compressor and expect it to perform in supplying a high performance (high demand) air tool. You need to match the air compressors ability to deliver compressed air with the demand of the air tool to be happy with the air tool performance. What Criteria for Picking Air Tool & Air Compressor? Find out by reading the manual or look on the label on the tool itself. It should indicate how many CFM of compressed air at a certain pressure is necessary to properly run that air tool. To be satisfied with the air compressor / air tool combination, if the air tool will be used continuously over a period of time, the supply capacity of the air compressor must at least equal the demand of that air tool. Remember the rule of thumb of compressor supply. Each HP of air compressor motor should deliver around 4 CFM of compressed air at 90 PSI pressure. If the air tool demands 8 CFM of air at 90 PSI to run properly, and you have a 1 HP air compressor, sorry, you will not be able to run that air tool effectively for more than a few seconds. Smallest Air Compressor For Air Tools? Simple answer when you boil it down. If the demand of your air tool is equal too or less than the air compressor capacity, then you have the right air compressor for the job. If the air demand of the air tool exceeds the compressed air delivery capacity of that air compressor, and you want to run that air tool consistently, then you have too small an air compressor. Not knowing the demand of the air tools you intend to have in your workshop quite often means that you will end up with an air compressor too small to run some of those tools. Figure out what air tools you expect to use, find out the demand of compressed air for the highest demanding air tool you want to use, and then size the air compressor to deliver at least that amount of air. And yes, I do understand that the delivery capacity of an air compressor can vary depending on the pressure. For example, an air tool using 40 PSI can be supplied effectively by a smaller air compressor than can a similar tool that needs to run on 90 PSI. However, in the interests of simplicity, and since most of the smaller air compressors can deliver 100 PSI or more, using 90 PSI as a base line for determining the compressor to tool size seems, at least to me, to be reasonable. Where can I find a air compressor small and light wait enough to run one air roofing air nailer that I could carry on my person.. If I spray paint I need arround 30-40psi. I know cfm is more important than psi here. My compressor can deliver 150psi.Then adding a regulator to the extra tank and set it a 40psi while setting the regulator of my compressor at maximum capacity should give me more air? I need to get a compressor for the almost exclusive use of an air blow gun. What size of tank would I need to run it with reasonable flow for about 1 and a half to 2 minutes? Please and thank you. Thank you. That was helpful and I appreciate it.